EmailReader reads a store of email messages, either locally from a delimited flat file, or on an external server. When looking at ports, it is necessary for use-case scenarios to be understood. This component has the ability to read data from a local source, or an external server. The component decides which case to use based on whether there is an edge connected to the single input port. Case One: If an edge is attached to the input port, the component assumes that it will be reading data locally. In many cases, this edge will come from a FlatFileReader. In this case, a file can contain multiple email message bodies separated by a chosen delimiter and each message will be passed one by one into the EmailReader for parsing and processing. Case Two: If an edge is not connected to the input port, the component assumes that messages will be read from an external server. In this case, the user must enter related attributes, such as the server host and protocol parameters, as well as any relevant username and/or password. EmailReader does not propagate metadata. EmailReader has metadata templates on its output ports. Fields of the templates have to be mapped using the Field Mapping attribute. Otherwise, null values are sent out to output ports. The number of attributes which are required or not depends solely on the configuration of the component. See Ports: in Case Two, where the edge is not connected to the input port, more attributes are required in order to connect to the external server. At minimum, the user must choose a protocol and enter a hostname for the server. Usually, a username and password is also required. Filters messages based on their status. The option ALL will read every message located on a server, regardless of its status. NEW fetches only messages that have not been read. Defines how parts of the email (standard and user-defined) will be mapped to Clover fields, see Mapping Fields. Defines the maximum number of messages to be downloaded. Any positive value defines the limit, negative value or 0 means unlimited. Specifies the URL of a file used to keep track of which messages have been read. POP3 servers by default have no way of keeping track of read/unread messages. If you wish to fetch only unread messages, you must download all of the messages IDs from the server and then compare them with a list of message IDs that have already been read. Using this method, only the messages that do not appear in this list are actually downloaded, thus saving bandwidth. This file is simply a delimited text file storing the unique IDs of messages that have already been read. Even if ALL messages is chosen, the user should still provide a cache file, as it will be populated by the messages read. Note: the pop cache file is universal; it can be shared amongst many inboxes, or the user can choose to maintain a separate cache for different mailboxes. EmailReader is a component suitable for reading of online or local email messages. This component parses email messages and writes their attributes out to two attached output ports. The first port, the content port, outputs relevant information about the email and body. The second port, the attachment port, writes information relevant to any attachments that the email contains. The content port will write one record per email message. The attachment port can write multiple records per email message; one record for each attachment it encounters. In its two tabs - Message and Attachments - you map incoming email fields to Clover fields by dragging and dropping. You will see metadata fields in a particular tab only if a corresponding edge is connected and has metadata assigned. The first output port influences the Message tab, the second output port influences the Attachments tab. Buttons on the right hand side allow you to perform Auto mapping, Clear selected mapping or Cancel all mappings. Buttons on the left hand side add or remove user-defined fields. User-defined Fields let you handle non-standardized email headers. Manually define a list of email header fields that should be populated from email message. For example, you can read additional email headers like Accept-Language, DKIM-Signature, Importance, In-Reply-To, Received, References, etc. See details on message headers at http://www.iana.org/assignments/message-headers/message-headers.xhtml. Be sure you have dedicated enough memory to your Java Virtual Machine (JVM). Depending on the size of your message attachments (if you choose to read them), you may need to allocate up to 512 MB to CloverDX so that it may effectively process the data. Quantity of messages to process from an external server EmailReader must connect to an external server, therefore you may reach bandwidth limitations. Processing a large number of messages which contain large attachments may bottleneck the application, waiting for the content to be downloaded. Use the NEW option whenever possible, and maintain a POP3 cache if using the POP3 protocol. This example describes the basic usage of EmailReader component. Read the email of Adam Smith (email: adam.smith@example.com, password: InquiryInto). Read all messages. The example.com can be accessed via POP3 protocol. The POP3 Cache File must be in an existing directory. 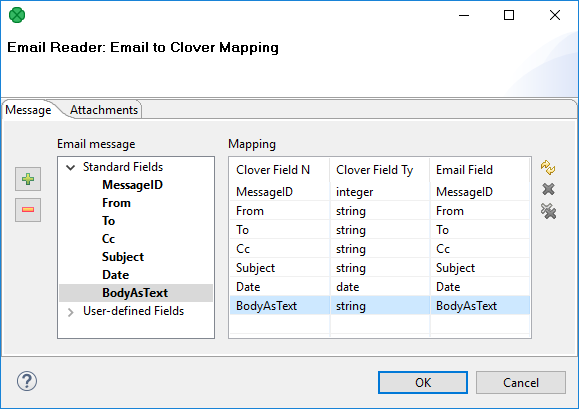 The Field Mapping can be defined on the Message tab of the Email to Clover Mapping dialog. This example describes reading attachments and saving the files under their original names. Read attachments from the email of John Doe (john.doe@example.com, password: MyKittenName123) and store the files into the data-out directory. The mailbox is accessible via IMAP4 protocol. Create a graph containing EmailReader and FlatFileWriter. Connect the second output port of EmailReader with FlatFileWriter. The Field Mapping in EmailReader can be configured on the Attachment tab of the Email to Clover Mapping dialog. You should filter out null file names before writing. Use Filter. You should handle duplicated file names as well. Auto mapping accessible via the Field mapping attribute is automatically performed when you first open this window.